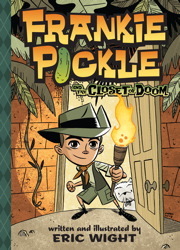 Little Zombies: Frankie Pickle and the Closet of Doom: You're gonna clean that up right? Frankie Pickle and the Closet of Doom: You're gonna clean that up right? Like most kids, Frankie Pickle hates cleaning his room. But what happens when his Mom says he never has to clean it again! Frankie and his unstoppable imagination mean fun. He and his side-kick Argyle become explorers swinging on vines, forging paths through piles of clothes, and scooting past lava pits! They perform flawless surgery on a broken action figure! They spend time in the big house. They even become superheroes. But will all this imagining be enough to conquer... the closet of DOOM? I was recommended this book by Matt David of matt-david.com (By the way have you checked out his artwork for us on zombiemommies.net?) Well I guess "thanks" to Matt, my son tried (successfully) to read this book at 11-something AT NIGHT after we had come back from a weekend trip... and he had school the next day (in which I let him sleep in and miss a little school). When my husband told me that our son was reading in bed and that I should be proud/happy? about that, I didn't realize he was serious! I mean, it was 11-something. Possibly midnight-something. I eventually realized the truth and placed it on the bookshelf to stay there and not to be read further at that time. Well I suppose it was a winner book for my son. For me-it was alright. Not horrible. Not wonderful. It was alright. But this morning my son picked up Frankie Pickle and the Pine Run 3000 and started to read that just before we left to school and ended up reading it while on the way to school. So winner, right? The book is also told with many pictures and some comic strip like pages in there as well. Great for reluctant readers, I'd say. Rated: 5 Bites because the child liked it and went for another book in the series!